But he wasn’t fine. It wasn’t until last year, after 9 years of marriage, I realized how very “not fine” he really was. In early 2017, my husband turned into someone I no longer recognized. Previous attempts to get clean were short-lived. It wasn't the physical part of the withdrawal that hindered his recovery as much as it was the mental and emotional aspects of living sober that he couldn't handle. As his addiction and mental illness progressed, the man I married disappeared. The morals and values I thought we shared had all but vanished. God's amazing grace led us to a wonderful nurse practitioner. She diagnosed my husband with bipolar disorder in August of 2017 and it was one of the most validating days of my life. When your gut is telling you something is wrong, it may actually be God telling you something is wrong. Don't be afraid to do your own research. Mental illness refers to various conditions that affect thoughts, moods, emotions, behaviours or a combination of those. It can affect how people function and relate to others. Mental illness does not discriminate. It affects men, women and children from all corners of the world. It's also important to note the typical age of onset for some mental illnesses isn't until late teens to the early twenties. Depression is characterized as long periods of sadness or apathy lasting more than two weeks. Bipolar Disorder causes severe, unusual mood shifts between depression and mania. Generalized Anxiety Disorder is characterized by excessive worry over a period of at least six months. Panic Disorder is characterized by having recurring panic attacks and fears about future panic attacks. Schizophrenia is characterized by severe changes in behavior and can also include hallucinations. Mental illness is not a sin! However, as followers of the Great Physician, we know God has the power to heal the heart... and the head! Mental illness is a sickness. It is not a sin to seek professional help and/or receive treatment. Click to Tweet: Mental illness is a sickness! It is not a sin to seek professional help and/or receive treatment. Receiving medical treatment for mental illness may very well be part of God's plan. In a broken world, our bodies don't function like God originally intended. Our bodies aren't perfect. We're only human. Spiritual healing isn't halted when the medical healing begins. It doesn't have to be one or the other. "Now when he heard this, he said, “It is not those who are well who need a doctor, but those who are sick." "A joyful heart is good medicine, but a broken spirit dries up the bones." God promises to never waste the pain we endure because He will use our struggles for good. For some believers, that truth doesn't hold enough weight to ease their heavy heart. "According to the CDC, each year more than 41,000 individuals die by suicide, leaving behind thousands of friends and family members to navigate the tragedy of their loss. Suicide is the 10th leading cause of death among adults in the U.S. and the 2nd leading cause of death among people aged 10-24; these rates are increasing. Research has found that about 90% of individuals who die by suicide experience mental illness." In relation to addiction statistics, addicts who have an underlying mental illness top the charts! Depending on the type and severity of the mental illness and the person's current mental state, finding faith may be difficult if their relationship with Christ isn't already established. Showing Christ's love through our own character and actions may be the best way to witness to the suffering during those difficult times. Not all addicts have a mental illness and not all of the mentally ill are addicts. If you think you or your loved one may be suffering from a mental illness, it's important to be proactive. Let mental health be just as important as physical health and please don't think that your faith is any less for doing so. God will send you and your loved one the right doctors, the right support and the right medication for you to be healthy as He originally intended. The right diagnosis can be life-changing and a precious life could be depending on it. Kara is a daughter of the one true King, wife to her husband of 9 years, and mother to three precious children. 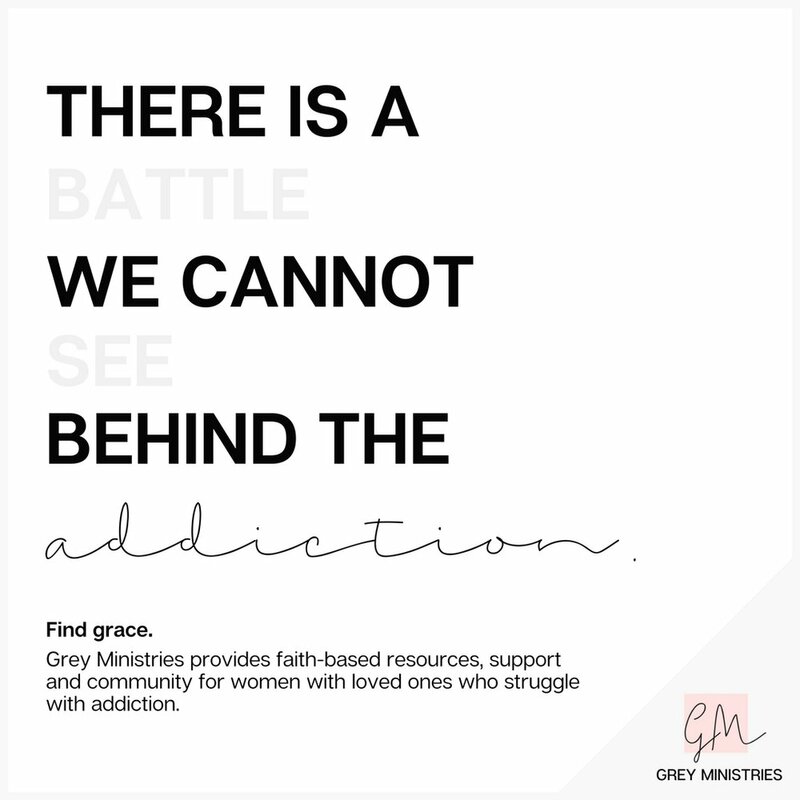 As the wife of an addict, she was led to write the "Let Go" devotional series for Grey Ministries as a way to encourage others and share hope with those navigating through a life that's been shaken by a loved one's addiction. We appreciate Kara's heart for ministry and her work with Grey Ministries. You'll be hearing more from her soon!